Objective: Prayer includes asking God to provide for our needs and forgive us. Does God care about your wants or only your needs? Give me some examples of things you need to ask forgiveness for? Give me an example of a time that you had to forgive someone else. Verse: Matthew 6:9-12 (NIV) - Give us today our daily bread. And forgive us our debts, as we also have forgiven our debtors. - Matthew 6:9-12 - Give us today our daily bread. And forgive us our debts, as we also have forgiven our debtors. God, please forgive me for (specific sins) and help me to forgive those who do wrong things to me. - Place the Our Daily Bread worksheet in a shallow box or jellyroll pan. Squeeze small amounts of paint on worksheet. Set a few marbles on the paper. Roll the marbles around by carefully shifting the box from side to side and forward and backward. The marbles will roll the paint around to decorate the worksheet. Let dry and cut out each item. - Make a loaf of bread to give to someone and explain the Lord's Prayer. Write the numbers on the My Clock worksheet. Do this several times so that child remembers where the number "one" is placed. - Take a trip to a local aquarium. - Make Berry Blue Jello in individual clear plastic cups. Add gummy fish in the jello before it sets. - Cut a coffee filter in the shape of a fish. Using washable markers, color the fish. Spray the filter with water and watch the colors "swim" together. - Octopus: Blow up a balloon and draw a face on it. Add eight legs (folded up paper, long balloons, or crepe paper) to create an octopus. - Have the child draw a picture of her favorite ocean animal. Build a road system using painter's tape. With a basic figure-eight setup, make a few exits to visit various places. After creating the road, discuss places that cars can take you. 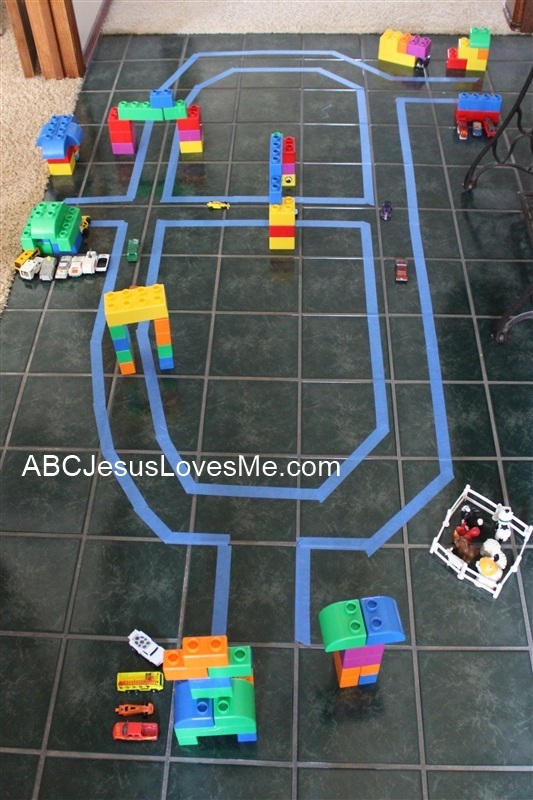 Using Duplo Legos, build your favorite stops - church, Walmart, Sonic, carwash, and houses. Add other items like animals and bridges along the road as well. Note: Do not use masking tape, as it will leave a residue. Go look at the license plate on your vehicle. Talk about the different parts of the plate. 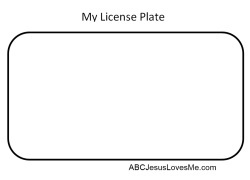 Create your own using the My License Plate worksheet. - Play "Red Light, Green Light" as a fun way to practice the obedience of stopping when told to do so. Using only the green (go) and red (stop or freeze) concepts of this game, play this game while on a trampoline, doing an activity at the park, or running or walking beside each other. Teach the child to immediately stop when given the "red light" command. If the child learns this skill, it can be used in an emergency situation such as a parking lot. - Make a stoplight with three circles - red, yellow, and green. Color the Stoplight worksheet or use as a template. - Crossing the Street - Visit a few intersections to practice these rules. Stop at the curb or edge of the road before crossing. Never run into a street or in a parking lot. Look and listen for traffic to the left, then to the right,and then to the left again. Cross using crosswalks. Obey the traffic signals and signs. Keep looking while crossing the street. Always watch out for cars. The drivers may not see pedestrians or yield right of way. Gather some small shallow containers and put a little paint on each. Drive a car through one container of paint to cover the wheels. Roll the car over a piece of paper. To avoid mixing the colors, assign one car per color of paint. Hold a "car wash" afterwards to remove the paint. Use the Bb Writing worksheet and for further learning check out the Letter B Activities. Taking turns writing numbers 0-30 on 3/4" Tracing Paper. Discuss how Enemy Pie is realistic fiction. Although it could have happened, the events and characters are not true. - Use this book to discuss friendship, enemies, judging people by their appearance, etc. Also use with Matthew 6:12 the Lord's Prayer. - Create your own "Friendship" recipe. Let the child come up with the ingredients and amounts. - Make Kansas Dirt Cake - Discuss how what looks like dirt may actually tastes amazing! Crush cookies and put half in a 9x13 pan. Melt margarine and mix with cream cheese. Add powdered sugar and vanilla. Mix well. Have your child cut around shapes that you have drawn on construction paper. Draw an oval, rectangle, heart and diamond using thick lines or cut along spiral lines to create a snake .